ALEXANDRIA, Va. – Global efforts to address transport-related greenhouse gas emissions and air pollution, as well as mitigate congestion in major cities, will have a noticeable impact on fuels and vehicles markets around the world. 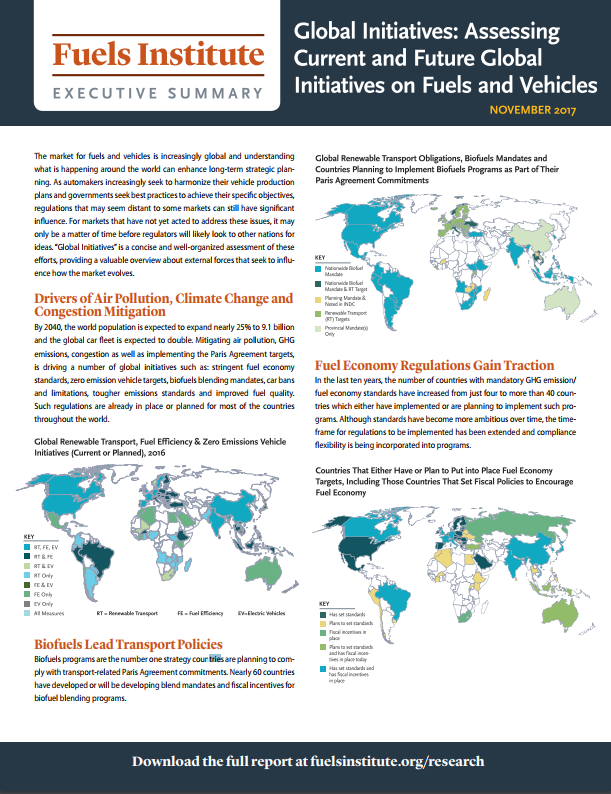 In fact, a majority of countries have already implemented relevant policies and many more are expected to follow suit in the coming years, according to a new report, “Global Initiatives: Assessing Current and Future Global Initiatives on Fuels and Vehicles,” released today by the Fuels Institute. By the year 2040, the world population is expected to grow by 25% to 9.1 billion people and the global car fleet is expected to double. With such extraordinary growth on the horizon, it is not surprising governments around the world are increasingly announcing and/or implementing initiatives to tighten fuel economy and emissions standards, set zero emission vehicle targets, mandate more blending of biofuels, ban or otherwise limit driving and improve overall fuel quality. In order to better understand the future of mobility in any given market, it is essential to think globally. Automakers are increasingly seeking to harmonize their vehicle production plans. At the same time, governments are learning from one another best practices to combat universal problems like smog, air pollution and congestion due to increased vehicle travel. “Global Initiatives” discusses and compares the current and future governmental regulations affecting the fuels and vehicles market. Along with highlighting trends in initiatives, the report also gives a fantastic oversight of where these regulations are currently being implemented and how fast they are spreading across the globe. The Fuels Institute, founded by NACS in 2013, is a non-profit research-oriented think tank that evaluates market issues related to vehicles and the fuels that power them, incorporating the perspective of diverse stakeholders to develop and publish peer-reviewed, comprehensive, fact-based research projects. The Fuels Institute is a non-biased organization that does not advocate.